With 52% of consumers already saying push messages are an “annoying distraction,” the time is now to evaluate your mobile strategy and avoid falling victim to the mobile engagement crisis. I recently shared with MarketingLand five push notification best practices that will help you do just that and instead, create deep, personalized relationships with your users. For your convenience, I’ve summarized them below; you can also learn more about these tips in my MarketingLand column. Too often, push messages are used incorrectly as just another version of email because most marketers just apply their digital strategy to their interactions with mobile users. The problem is that this tactic ignores the promise of mobile to deepen user relationships. Mobile requires big thinking, because the benefits of mobile go far beyond what is possible with the web. Start with what you know about your users and their mobile context, and then get creative. Most companies start a mobile personalization strategy by segmenting users based on their in-app behaviors or known information about them from their CRM. It’s a great way to start but the real path to mobile success comes at the next level of segmentation: when you segment audiences by both user profiles and behaviors. The average click rate for push messages sent based on behavioral and profile data is a whooping 30.6%. Segmenting your audience based on everything you know about your users gives you a more well-rounded look into who your users are and what they want from you. Engagement: Since every mobile interaction is personal to the end recipient, it is critical to understand if a push message helped or hurt user engagement. One good metric for measuring true engagement is the lift in the frequency or length of app session. Did the push message cause your users to increase the number and/or length of their app sessions (or vice versa) compared to users who didn’t interact with the message? Revenue or lifetime value: Beyond the initial purchase/conversion, does a push message create more value from your users over time? Mobile should create new revenue streams, whether you look at it in monetary terms or otherwise. Long-term conversion: Beyond the initial conversation rate, do the users who receive your campaigns “convert” more often and at higher rates than the average user? Retention: No matter what your goal is, a push campaign should never result in user churn. Knowing if your push marketing is helping to keep users is a critical KPI for all businesses. Finding the best day of the week or time of day to send a push message may be an afterthought but is often the difference between a welcome message and a spammy one. Our data shows that currently Thursday has a slight edge as the best day for high click rates, but there is actually very little variance between days. This just an average across all push notifications in our sample, which means your best time of day may be very different. You must test this out for yourself. When you do find the best day of the week, you’re likely to be sending push notifications that meet users’ needs. Timing based on day of the week isn’t enough. Once you know what day of the week is best, you should compliment that with the time of day. Our data shows sending messages between 10 A.M and 12 P.M. results in the highest average click rate at 15%. Mid-morning to afternoon performs well because people check their phones while waiting for meetings to begin, during lunch breaks, or anytime they want to just take a break from work, while the other parts of the day can be crowded with activities, commuting, cooking meals, or sleeping. Not only must you test to find out the best timing for your push notifications, you must continuously learn about your audience and adapt over time. It was just a little over a year ago when Friday had the highest click rate and the afternoon was the best time to send a push message. The mobile world changes at the speed of light - timing and testing are two of the keys to keeping up with consumers. Depending on the app category, the content of a successful push message can look very different but there are words that can make a difference. When using a push message to promote a discount, try using the word “off” in the content. Messages with the word “off” resulted in an average click rate of 15.5%, a lift of 5.3 percentage points compared to the average. When the goal is to get users who have been away to return to the app, the word “come” works well. For example, you could say, “Come see the newest features we have to offer!” Messages including this word had an above average click rate of 13.2%. Lastly, a great way to promote limited or new content would be to use the word “only”. This word suggests the content of the message will be available for a short time, and users should respond quickly. Push messages with the word “only” yielded a 12.9% average click rate. Looking separately at just the call-to-actions within a push notification, the phrase “shop now” resulted in an average click rate of 14.9%. “Shop now” is a great way for eCommerce apps to detail exactly what they want users to do: buy something on their app. Pairing this phrase with personalized information about users will give them even more reason to shop on your app. Personalizing the content of a message with proven words and CTAs helps to provide the motivation users may need to keep engaging with your brand. 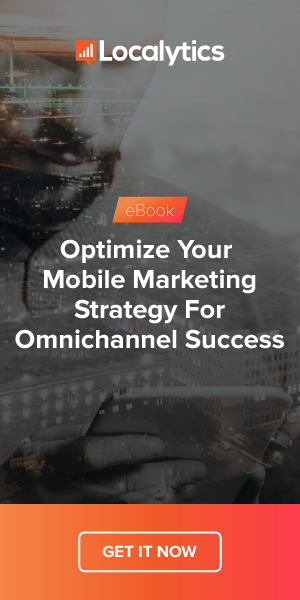 BONUS TIP: These five best practices are not optional when it comes to great mobile engagement, but the specifics of the supporting data points are not a “one size fit all” situation. It is important to test these variables against your specific users and see what works best for them. But I guarantee when you do, you’ll have the foundation you need to start building the business case for a comprehensive mobile strategy. Localytics is the leading mobile engagement platform across more than 2.7 billion devices and 37,000 mobile and web apps. Localytics processes 120 billion data points monthly. For this analysis, we analyzed over 20,000 push messages. click rates are defined as users who received a push message and then opened it. For determining the click rates based on broadcast vs personalized push messages, broadcast is defined as messages that are sent to all of an app’s users, while segmented messages are sent to smaller groups of users based on similar behaviors and/or profiles. For the “proven words” analysis, we grouped similar messages into three common use cases and then found the most common words used and click rates in each group. The timeframe for this data was Q4 2015 and is based on global data. **These five best practices originally appeared in MarketingLand on April 20, 2016.